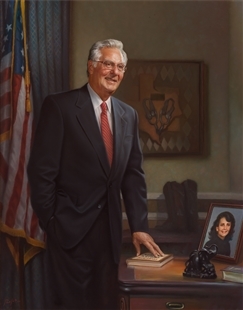 Minority Leader John Rhodes’ portrait was unveiled in 1981, after he left Congress. 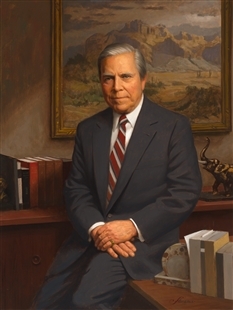 Artist Herbert Abrams included a landscape painting of Rhodes’ native Arizona above a statuette of an elephant, the Republican Party symbol. Abrams studied in New York City at the Pratt Institute and the Art Students League, pursuing portraiture throughout his career.